Is Disney planning to build theme parks in other countries than China? Will we see one day a Disney park in India? Or in another country? We will talk about this, but before, here are the latest news about the Hong Kong negociations as it seems that the Hong Kong Disneyland problem may be resolved soon. After months - if not years - of negociations with the HK government and the recent dramatic development with the WDC announcing that they will disbanded the team of HKDL Imagineers working on the awaited expansion projects, Hong Kong Financial Secretary John Tsang met with Disney executives including Jay Rasulo and parks Chief Financial Officer Jim Hunt last Friday in Los Angeles. According to Reuters press agency a "Hong Kong Disneyland deal could happen soon". Spokesman Patrick Wong said "We had very good discussions with the Disney management yesterday. We are happy with the progress achieved at the negotiations regarding Hong Kong Disneyland's expansion plans. There are still a number of issues to be sorted out but we hope that an agreement could be reached quite soon." And Disney spokeswoman Tasia Filippatos said on Saturday that Disney was "encouraged by the recent discussions with our partners regarding the expansion of Hong Kong Disneyland and are optimistic we will be able to finalize a deal to move forward on exciting new plans for the park". Reuters also reports that in Hong Kong "officials said the talks had broken fresh ground and details on Disney's expansion would be announced soon." And Rita Lau, Hong Kong's Secretary for Commerce and Economic Development added "According to my understanding, on a number of important and significant points, everyone is beginning to have little breakthroughs". Good news. Happy to learn that HKDL will probably have new lands and attractions in a near future. As always, everything is a question of money in these talks and, although Chinese negociators can be really tough, i suppose that they finally found an "agreement" with the WDC. And let's not forget that Hong Kong is part of China, so any HKDL agreement will probably have a good effect on the Shanghaî Disneyland project, always waiting for its final approval from Beijing Central Government. All this may arrive at the right time, specially considering that Universal announced recently that they're planning to build a Universal Studios theme park in Beijing. Universal, too, is waiting for Beijing officials approval on their project. Which means that there is now TWO major theme park projects waiting for approval in China! Let's go to India, now. 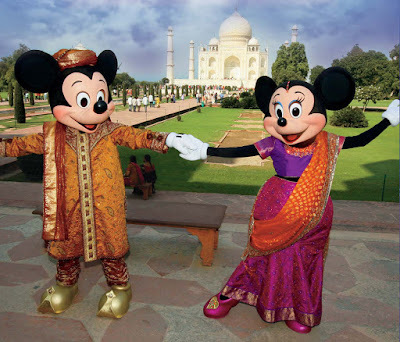 If the question is "Is the Walt Disney Company planning to build a theme park in India? ", the answer is "no". But if the question was "Are they thinking about India for a future Disney theme park? ", then the answer is "yes, definitely, they're thinking about it". Now, don't get me wrong, it doesn't mean that New Delhi or Bombay will have a new Magic Kingdom anytime soon. The WDC is just seriously "thinking" about it. Strictly on a "business" point of view, it's perfectly understandable. After all, more than one billion people are living in India and this great country is in full economic development. And considering that Disney don't have in mind to open a theme park in India before ten years, in the meantime India could be economically ready for a success of this future park. But for me, the question is not "Are they going to build a MK in India or not" but more: "Is it really a good idea?". Let me tell you more about what i have in mind. When Disney decided some years ago to build HKDL they probably thought that the park would be an instant success. After all, Japanese are in love with Disneyland, so why not the Chinese? Then the park opened and the cultural shock arrived. In France families may accept that children miss a day at school so they can go at DLP on week days to avoid the week-end crowds. But for Chinese it's purely unthinkable. One of the most important thing for Chinese people is the "security of the future". Which means that school success of their children is priority number one. Chinese and Japanese have totally different mental structures, that's where Disney did the mistake for HK. I think it's fair to say that Japanese are living more in the "present" and Chinese, traditionally, are more in the "future" - although i won't be surprised if China's incredible development will help young generations to live more and more in the "present". Now, why am I talking about all that? Simply because of the cultural differences. The major mistake that almost EVERY U.S big corporation is always doing is to ignore the cultural differences between the U.S and other countries. And we can't even blame them, because it's not their fault. The "mind" of a corporation is made in such way that they simply can't understand that. I suppose that any of them would probably tell you that they're not enough stupid to don't see the differences between the U.S and India, the "caste" problems, and so on... and that's right. They DO see that. What they DON'T see is another plan, more subtle. If we take, as i do today, the example of India what will be difficult for them to understand is the "spirit" of India. As Indian philosopher Sri Aurobindo once said "India is the heart of the Earth". No other country in the world was - and still is - more spiritual than India. The inevitable - and perfectly welcome - economic development is changing this, but i think we must give some time to the country before landing with a pure occidental concept like Disneyland. In a country which have literally a pantheon of gods, Disneyland mythologies will be nothing. I agree that Indian people can be enough ludic to enjoy Disneyland but i'm not sure that DL mythologies have a lot of resonances for India's collective subconscious. I have the greater respect for India civilisation, i think India's original vision of the world is stunning and i think that we probably have more to learn from them than they have from us. India have some of the greatest minds, artists and scientists in the world. I don't like too much the "caste" system, an heritage from medieval times, but i LOVE India. And i think that the WDC should understand the part of India which is "another planet" for us. And wait quite a while before building a Disney theme park over there. For the sake of India. That's my opinion - only mine. Now, if they don't build a park in India, where else could they build one? There were many rumors about a project for Australia in Sydney, but sorry to disappoint my Australian readers, the WDC do NOT have plans to build a theme park down under. Not enough people living in the area to have the project economically viable. Then, other rumors talked about Singapore. Sorry, but you can also forget about Singapore. Not because Universal Singapore will open soon, but because Singapore is mainly a hub, and Disney think it's not enough economically viable to build a park and resort over there. Specially considering that Singapore is only at two hours flight from Hong Kong. So, where else? Well, there IS another destination that Disney is looking at. It's South America. Don't expect any Magic Kingdom over there anytime soon, but they are definitely looking, thinking, about having a Disney theme park in South America in the future. And if you want my opinion, i think there WILL be one. Not in a near future, though, probably not before ten or fifteen years, but i am confident that one day there will be one. And in which country of South America, you ask? In Brazil, my friends. In the area of Rio de Janeiro. This is the location that Disney have in mind to build a Disney theme park, some day. I suppose that my Carioca readers will find this news exciting, but once again you better be patient, because absolutely nothing is done yet. I have to agree that Brazil and Rio de Janeiro which is one of the most visited place in South America - not to mention its gorgeous scenery - would be a perfect place indeed. Also, the "cultural shock" wouldn't be the same than it could be with India. So, one day, 80 or 90 years after Walt and his great Animators came to Rio in 1941 to find inspiration for "Saludos Amigos", Disney will probably be back, and this time it will be to build a Magic Kingdom. Those of you who thinking there is enough MK clones outside America shouldn't worry. Disney have learned the lesson and you will be really surprised how Shanghaî Disneyland will be a different and very enjoyable new kind of Magic Kingdom. As for Brazil, you better be patient Cariocas friends, but i think it will happen...in a not-so-near future. They need to stop making so many themeparks in other countries and focus more on the parks in the U.S! If i am not wrong there is an Universal and a Bush garden Seaworld and discovery cove comming and you also have Dubailand. About Dubai, you will have the answer to your question soon, probably tomorrow! "They need to stop making so many themeparks in other countries and focus more on the parks in the U.S"
But why that ? How come the world should have less chance to go to a Disney park so that the US parks get more TLC. We know Disney is building more parks for the money but what matters is the outcome : More people will get to go to Disney parks. That is what I wish the most. Alain, the WDC is currently in negociations to build a south american theme park in Peru, not in Brazil, take a look: http://www.livinginperu.com/news/8676. Disney denies the 'rumor', the same way they did in France (mid 1980's) and China (late 1990's), do you remember? Hello, I'm from Israel and I think that the WDC should stop build theme parks outside of the u.s.
People need to understand that a huge part of the magic of the Disney parks is the american spirit and attitude which obviously works best in the u.s.
That's what people used to get from Disney and that's what they would like to keep getting from Disney. As much as I would love to have a Disney park near me, in the middle east, in my language, it won't be the same product, the same dream. It will just be another Disney park but not "my Disney". @Anonymous, Alain: As far as I'm informed by somebody who lives there, most big-budget projects in Dubai are on-hold. Dubailand, the location where Universal, Dreamworks Animation, Six Flags et all would have build a massive amount of theme parks, is still a desert. Most project are either on-hold or entirely scrapped. The Universal park broke ground, but only the gate has been build. The Anheuser-Bush projects (Bush Gardens, SeaWorld) on the new Palm Isle has been put on-hold (rumors are, it has been canceled), etc. etc. So, Dubai is not really such a nice place to invest in at this moment. And I think it would be much better for Disney to stay out of it. Not just because the big real estate developers like Tatweer, Emaar, etc. have run out of money, but it wouldn't work. Dubai has been floating on a real-estate bubble, which involves selling properties at a maximum profit. Disney isn't into real-estate (at least not in the traditional sense), it doesn't sell property, it sells entertainment. For this to work you need something called "tourists". Hong Kong Disneylands target was 5.6 million visitors a year and it is falling far behind that. Mind you, this Resort/park is tiny compared to other Disney properties. So Disney would at least target for some 5 to 7 million visitors a year, or else it would just not be economically viable. Dubai and the region around it isn't really known for its high-density population, it's a desert and you have to take a plane, boat or a very long camel ride to get to somewhere else where people live in larger quantities. In 2007, about 6.5 million tourists visited Dubai. Numbers were in the plus, up until crisis struck, but even without a crisis, there would be no magical multiplication of tourists in the foreseeable future. So, how exactly are you going to fill a huge Disney park with those potential Dubai tourists? Right, you're not going to do that. There are not enough people. Most of them multi-billion dollar projects... All targeting in the range of 2 to 4 million visitors annually. And, most of them finished somewhere between 2009 and 2012, with tourist numbers still around 7~8 million at best (probably less, mind you, we have some kind of economic crisis going on). John321; Thanks for your comment. I knew already that most if not all Dubai projects were canceled, and i just finished two hours ago tomorrow's article where i mention that, along with other things. But thanks again for your comment! Here are a few things to keep in mind about the next Disney theme park. They're politically incorrect, but nonetheless true. Disney will not build in India. It is not a 'spiritual country.' It is an overpopulated nation of abject poverty. And Pakistan's nukes are still set on a hair-trigger over Kashmir. Way too risky. Disney will not build in Brazil. The lax social mores and incredibly high crime rate would ruin Disney's reputation within weeks of opening, if not sooner. Disney will not build in Dubai. Dubai will be torn between ridiculous amounts of oil wealth and backwards Islamic laws for decades to come. And besides, recent over-construction and economic downturns have left many projects going belly-up. How does something of such wholesome fun (Disney) compete with the garishness of indoor skiing on machine-made snow? How does something like Disney--so based in democracy and freedom--not offend Arab 'sensibilities' on a daily basis? News flash: they still think we're the great Satan. So, take away style points for me telling it like it is instead of sugar-coating it. But it's still true. The world economy will prevent a new park anywhere any time soon anyway. And when things do get better, we'll see long-awaited improvements to Paris, Lake Buena Vista, then a 3rd gate at Disneyland. Bank on it. To anonymous: I agree that Indian people are poor (not all of them, though) but that doesn't mean it's not, too, a spiritual country. Struugle for life and spirituality can co-exist. And about Dubai, my article today bring the answer. Can you see Muslims and Hindus enjoying the same attractions, standing/sitting side by side? Never mind the castes within each religion. Hong Kong was a mistake. They know this now. There simply won't be any other Disneylands. And that's a good thing. I don't think honestly that Hong Kong was a mistake. It was certainly a mistake to don't build a park bigger - and god knows that the imagineers did their best with the budget they had - but it was not a mistake to build a park in HK. I think, location-wise, Hong Kong can hardly be a mistake. About 7 million people live in Hong Kong alone and many more in the region around it, it has a massive amount of tourists and Macau, another popular attraction for both locals and foreign tourists is just around the corner. Also, Hong Kong is a rather rich region, so there should be enough people capable of spending some money at the park. Additionally, it is just a few miles away and on the same island as the new airport. - Opening a half finished park. - Not adapting enough to the local culture, although you could argue, this makes Disney unique. - Not adding anything special for visitors that have been to other Disney parks. Hong Kong is fixable, but it takes a lot of money and an agreement with the local government. Both seem to be underway, so there is hope. To anonymous who thinks Muslims / Hindus won't sit side by side, or people of separate castes...they have no concept of daily life in South Asia. Yes there are serious problems on these issues which shouldn't be swept under the rug, but life for most people doesn't revolve around them. India isn't ready for a Disney park now...there is not enough wealth just yet and the security situation in Pakistan is deteriorating (leading to threats such as the Taj Hotel attack). However in three or four decades the scenario here may well be favorable for Disney. I agree with the comments above - Hong Kong is a great location for a Disney resort and the actual Disneyland location with the mountain backdrop and rapid transport links has to be the best of any resort with the possible exception of Tokyo. What's needed are more attractions and other supporting infrastructure to turn it into a fully fledged resort. Disneyland Paris was a flop initially but they had great park to build on plus a Downtown Disney complex and a golf course. What HK needs is to build out in a similar way to Tokyo & Anaheim -build a downtown disney / inpirari type area to catch people leaving the park (perhaps with something like a world showcase global village theme), build out the park to make it a full day experience with some HK unique attractions and add some other attractions facilities to make it a true resort (how about a Fantiasia Gardens mini golf, boating facilites on the lake or a convention centre?). Wasn't there a rumor about a Disney Hotel & time share project for Australia, similar to the one going up in Hawaii? Ofcourse we see hindu and muslim people mingle together and take a ride. We've seen that everyday.....many many centuries now. Its way better than Americans thinking of sitting besides muslims...and "spiritual country" means a lot more than what you comprehend. As for India being a poor country, i agree.....but its not much poorer than many other countries that Disney has already ventured into. All India lacks is the Infrastructure that Disney's type parks expect. Furthermore, "overpopulation" is something disney wouldn't mind, it just helps more. lastly, Kashmir issue has nothing to do with this too....arent any other major international brands surviving...rather Thriving in India? or maybe Disney is way too hesitant and insecure [like most american companies] to venture into the land of 'unknown' for them....an area that they still cant quite figure out for profit making purpose. living in India and I agree, india has a large population ,ppl are obsessed with anything American and everyone wants to go to disney. Right now everybody goes to Universal in Singapore but If disney came up here, everybody would come here.Besides whoever says that Muslims and Hindus cant live together in harmony has never visited India. Even Caste systems dont exist in most places (only villages) Its true that the infrastracture is the main problem,but the government is working to build new structures here. terrorism is all over the world,not just in India,so yeah they should build a disney park in India.Besides India has the second largest population,one of the fastest growing economies,home to many influential and rich ppl,etc. Dear disney well wisher, it's difficult to be absolutely sure that a Disney theme park will come to India. But i think that Disney is interested by it, but probably not immediately. I think they might open a park in Brazil before coming to India. Or they might make a deal with an Indian company and open one. In any case it won't be before 2020, if not later.